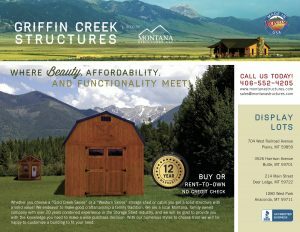 Welcome to customer reviews and testimonials for Montana Structures. 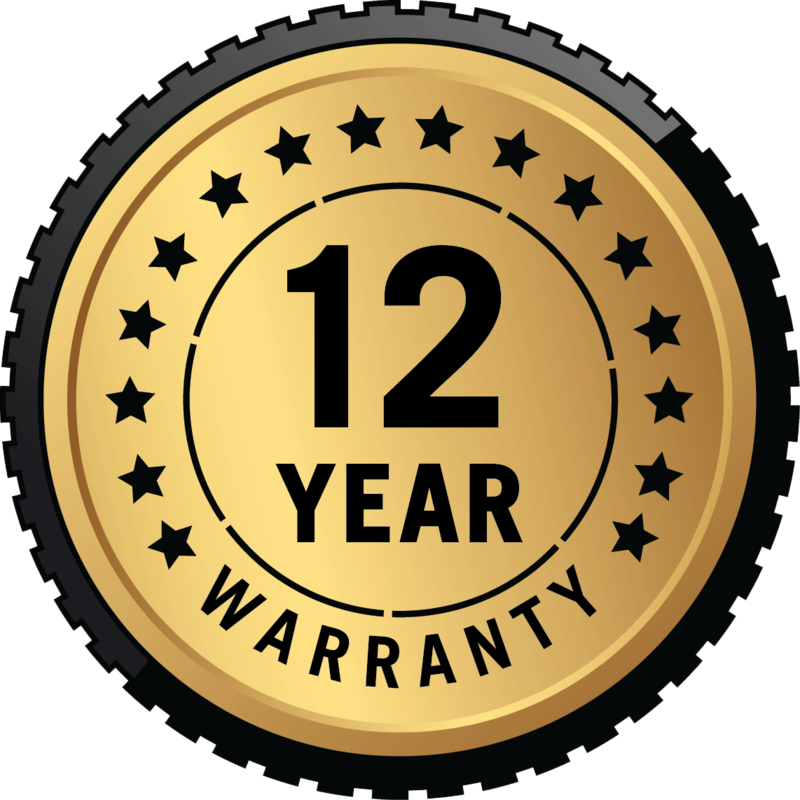 We love to hear from our customers and invite you to join our growing family of happy customers! Everything looks great, and great job! Your delivery folks also did a fine job, very personable. The purchase and delivery process were very easy. The quality of the unfinished unit is excellent. I appreciated the recommendations for site prep as well as advice on finishing the unit. 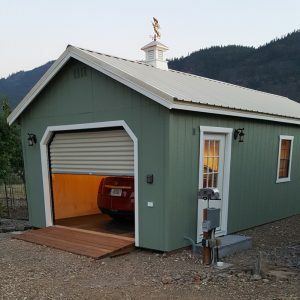 I’ve spent a bit of time finishing the unit to match my home as well as the interior so it is an all-season garage. Ceilings and walls are insulated and wired. Interior finished with pine paneling and floor finished with a rubber tile floor to be waterproof. I even put in heat and a window air conditioner to spoil myself and my little red baby… I couldn’t be happier. 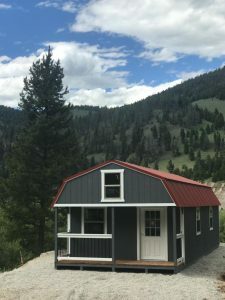 The crew from Montana Structures went above and beyond with my 14×36 cabin. They made the process very easy from start to finish. With out a doubt they made dreams come true. Thank you very much!! The 12 X 32 Utility Shed was delivered yesterday and I’m extremely pleased with it. Titus did a great job with the delivery, levelling and positioning. The quality of the building is outstanding! Many thanks and I’m looking forward to the other two buildings. I love the shed! The gentleman that delivered it was very cordial and did a great job getting it where I wanted it placed. I have a feeling another one is in my future. Thank you again! The Horse Barn is Perfect! I’ve been meaning to send you photos of the livestock shelter we ordered so you can see how it fits in with our other out-structures. 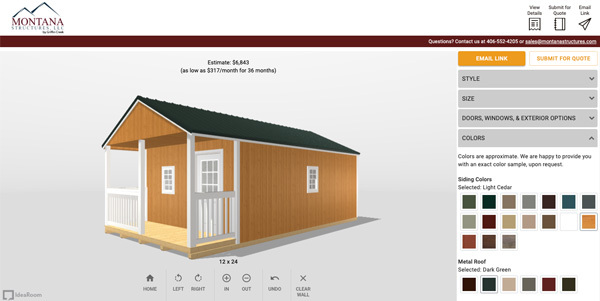 The time you spent working with my husband and I clarifying the stain color, roof color, and size of tack-room really paid off. As you can see it’s “perfect.” I also wanted to comment on the delivery service you used. The gentleman that delivered the pre-fabricated shelter was prompt and professional. I was mesmerised as I watched one man, along with a piece of machinery, move the shelter behind the existing garage and around the trees. 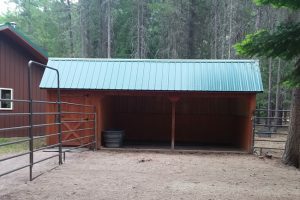 Not only am I happy with the product and service, so are my horses who now use the shelter. Thank you so much! I just wanted to thank you guys again for all your efforts on the shed and your quality work. The shed is excellent and we are very pleased, it was a pleasure doing business with you. Thanks again! I want to say this entire experience was very good. 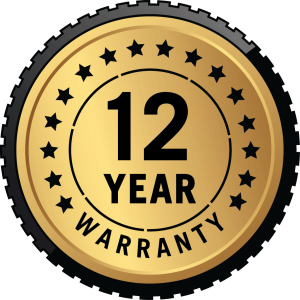 I think the customer service and communication that I have received from the initial point of inquiry, to clarifications and order placement, through delivery and follow-up have been top notch. It would be a very welcome breath of fresh air if more of our locally owned/operated companies adopted a business model similar to that of Montana Structures LLC and their affiliates. Jon….we received the greenhouse today! It is beautiful and way beyond our expectations. Howard did a fantastic job, and Titus, who delivered was very thorough. Thank you so very much. Several neighbors came by to check it out and all think it is very nice. We made sure we told them we purchased it though you. I am attempting to send some photos. They may have to be sent one at a time. Sorry if that is the case. Thanks again.